(Above) This was Holland Park Dog Show in 1923. Keeshonds were at that time known as Dutch Barge Dogs. They were in a class for Foreign (Any Variety) as they weren't yet recognised by the Kennel Club. 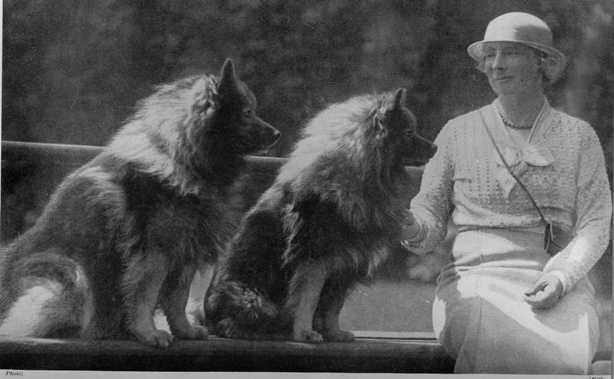 Mrs. Wingfield Digby, who first saw the breed on the canals of Holland when she was a young girl, is on the left with Breda and Saanie. 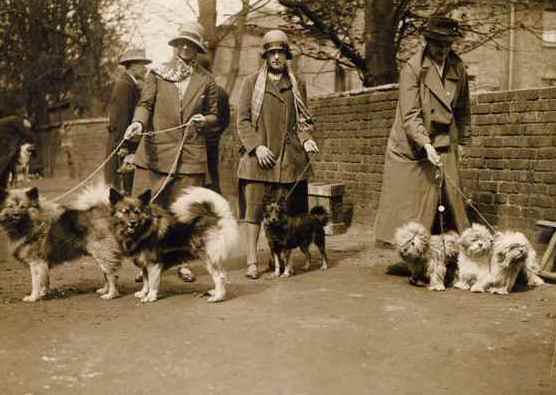 The lady in the centre is holding Mrs. Wingfield Digby's Icelandic Sheepdog. 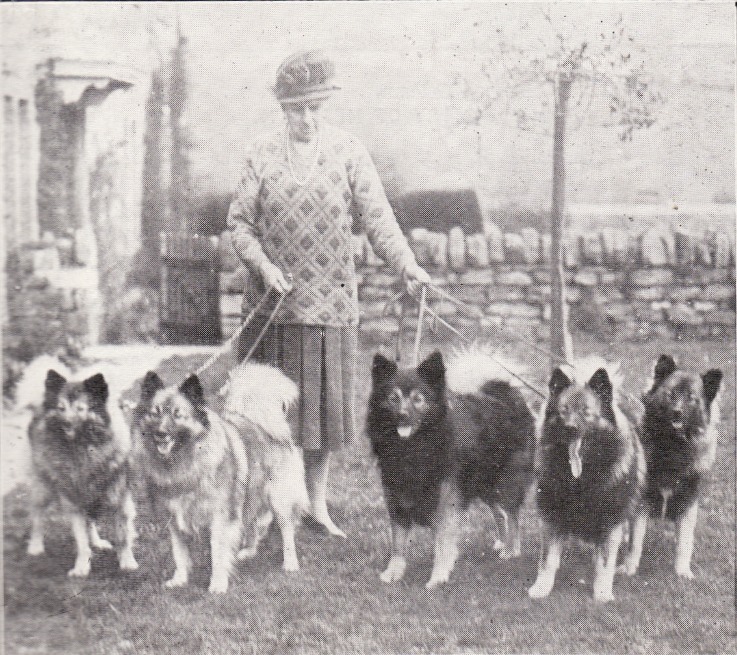 Although the Ven kennel did not start activities until the early 1940's Mollie Collins (above) belongs here with the pioneers as she started her Keeshond activities in the early 1930's in the US as Mrs Richard Fort, using the Van Sandar kennel name. To read more about Mollie, click here. This photo (below) shows Mrs. Wingfield Digby in the early 1930's with Kendrik and Ch. Konstanz van Zaandam. Konstanz was one of the big winners of his time, winning 11 Championship Certificates in all. By the end of the 1920's Baroness Burton (below) had begun to collaborate with Mrs. Wingfield Digby and was breeding the Dochfour Keeshonds. 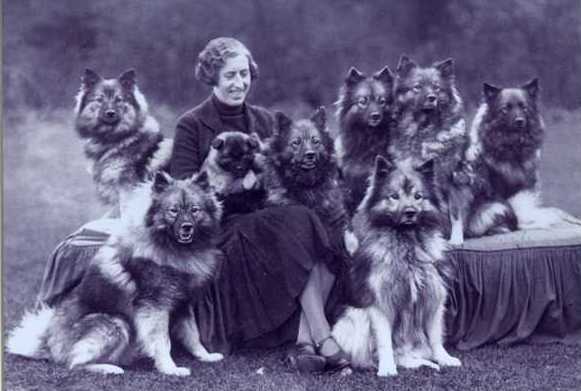 In 1925 though, she was still the owner of nearly 100 cairn terriers at her kennels near Inverness. This picture of her comes from an "Our Dogs" supplement of 1925. Mrs Morton (above) owned the de Witt Keeshonds. 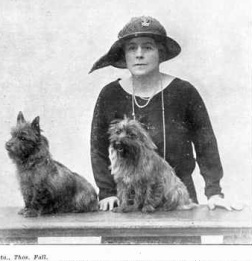 Her husband was the first secretary of the newly inaugurated Dutch Barge Dog Club in 1925. She died in 1931 having been a major breeder until that time. Her dogs were dispersed among other fanciers. These magnificent dogs (above) are Evenlodes. The photo dates from 1935 and shows their breeder, Miss Osmonda Hastings holding the reins.